Controladora means in Spanish controller, this is a simple yet powerful Expert Advisor that allows you to control your trading easily and precisely. Do you want to stop your trade when the price cross a trend line? Don't worry, Controladora can do it. Do you want to take profit when the price reaches the top of a channel? Controladora can do it as well. Calculating the exact proportion of your account by opening a trade, which size represents in case of loss a percentage of your balance, is time expensive and almost impossible without help if you are scalping. With Controladora there is no problem, use a standard stop loss in pips or fixed one by you as well. When you want to evaluate a trade signal, Controladora will help you to see if the risk profit matches your strategy criteria by showing the level, at which you need to exit to cover your desired risk reward. Do you want to divide a trade in multiple entries to take profit at different prices automatically? There is no problem with Controladora, it can place a trade as a whole operation or divide it into several smaller trades. Do you use the stop close only (meaning close or open a trade only if the candle closes above or below a given level), Controladora can do it. With Controladora you can directly open trades from its discrete buy and sell buttons, but as well you can program stop and limit entries with it. As well you can decide between a direct touch or on candle close activation. Controladora can manage its own trades and can add all trades that already exist in the platform under the pair that displays in the attached chart. Controladora fulfills the FIFO requirement and sets the stops after opening the trade, so it can work with market or instant orders. Controladora, an Expert Advisor that will help you to manage your trades, made by a trader for traders. If you want to close the very first trade in the book under Controladora control (in fulfillment of the fifo rule), just press the red crossed button. 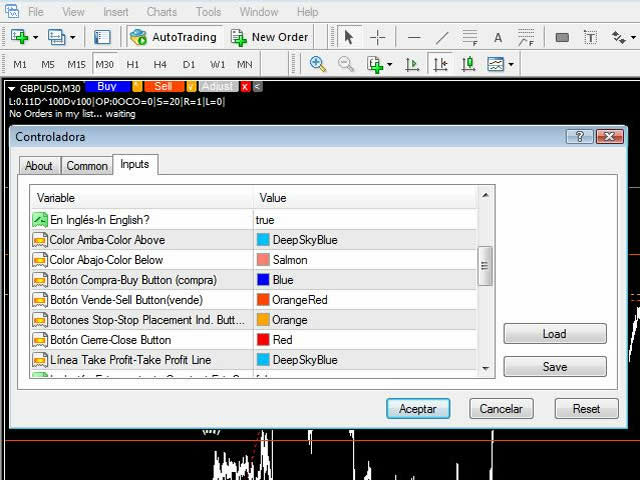 **Note that if you have previously opened trades outside of Controladora, if you want to close them with the X button, you will need to include them under the Controladora scope by pressing the gray button "Adjust"
If you want to add existing trades to the Controladora functions, just press the gray Adjust button. To hide these buttons in order to avoid accidental trades, just press the "<" dark gray button. If you want to manage to close a trade using trend lines (or as horizontal ones), just use the lines that appear once the Controladora takes control of a trade. Observe that due to FIFO rule, if you are going to use different exit levels the order must be first 1, then 2 then 3 and so forth. To close a trade above the opening price of the trade use the blue lines (named Above). To close a trade below the opening price of the trade use the coral lines (named Below). In multiple trades the smaller the number after Above or Below, the closer or at least at the same level must be in relation to the other exit levels. If you want to set pending entry order, use the price arrows to do it (any key will work as well), just name it as bs to set a buy above the actual price, ss to set a sell below the actual price, bl to set a buy below the actual price or sl to set a sell above the actual price. When an order is set properly, the arrow will be dragged to the actual bar (candle), this is how you know that the order has been recognized. If you want to delete all the pending orders that have placed just press on your toolbar the button arrows the last options, delete all arrows, and all the possible pending orders that could trigger will be gone. As Controladora is an EA that sends the instructions to the broker only when the conditions settled by you are met, the system could be named as a blind broker, which has the advantage that your broker won’t know where you have your entry or exit levels with the exception of the actual use of a direct stop loss and take profit for opened trades (we recommend use at least a direct stop loss as a catastrophic exit level). The down side of this is that in order to send a instruction, the platform must be connected and working, meaning that if for some reason your broker stop the connection or your platform cant send instructions to the broker, the price will cross the level you set and the Controladora will send the order (at the actual price) when the connection with the broker had been reestablished. When you have a stop loss indication too near to the actual price, the Controladora will alert you (with the MT4 alert mechanism) of this situation, you can use this as an alert level system as well. Legal 1 to 7 are just informative and are the legal notice that warn you that you’ll be using the EA at your own risk and we do not take any responsibilities for consequences resulting from any error or malfunction that could emerge due it use. Use it first on a demo account as long as you need in order to get familiarized with all functions and behaviors. Stop Placement Button, set the background color of the up (^) and down (v) stop indicative object buttons. **Note that if stop indication is above the actual price, the Buy Button will be hidden; and if stop indication is below the actual price, the Sell Button will be hidden in order to avoid opening and closing of an order at the same time because both conditions will be fulfilled at the same time. Close Color, set the color for the X button used to close the first open trade in the actual pair of the platform trading book. Color_Take_Profit, set the color for the visual line that shows you where the risk reward ratio is fulfilled. Constant External Operations Included, set it as true to make the Controladora take control of all incoming trades that you open manually (or with other Expert Advisors) at the actual pair. Show Buttons, set in off if you do not want the buttons to appear in the chart (opening of trades using arrows and closing by the Above/Below lines will still work). Show Take Profit means to show the line where the risk reward will be fulfilled, so turn it on if you want to see this indication in your chart, the Take Proft will replicate the style of the “stoploss” indication object (could be an arrow as is placed by pressing the orange up and down buttons, or could be a horizontal line that you place on your chart, just name it stoploss with lowercase and no spaces. Stop Close Only=1: set it to 1 if you want the Controladora await for the close above or below the object (could be the ss, bs, sl, bl arrows or the Above and Иудщц lines. If you want to execute the entry or exit for a trade with only the reach of the price in your chart (use bid price always) set this option to 0. Lines Width - set the width of the lines Above and Below, this could be from 0 to 4. Above Distance - set the number of pips above the actual price to place the Above exit lines when open or recognize a new trade. 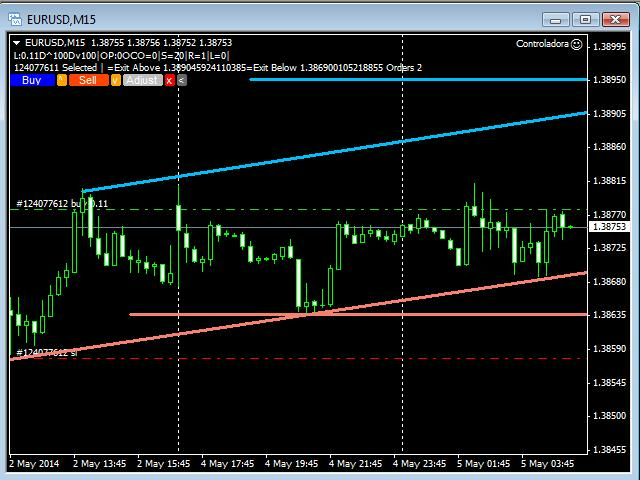 Below Distance - set the number of pips below the actual price to place the Below exit lines when open or recognize a new trade. Delay sets the time that must past between orders in milliseconds (some brokers may need it) you can set it as you need. Tolerance Slippage sets the tenths of pip (the fifth digit) allowed for slippage. Lots, If you trade with fixed lots strategy, set the number of lots to open here, if lots are different from 0 the percentage calculation for open new positions will be disabled. Risk %, set here the percentage of your trade account that you desire to risk in a trade (if multiple entries are instructed, Controladora will divide the trade into the number of entries instructed by repetitions, see below). Stops set a stop loss for any given trade that Controladora opens (does not change the stop loss level for trades opened out of the Controladora mechanism). If you have the stoploss object in your chart, the level (and calculations) for the real stop loss broker order will be instructed by this element adding a small tolerance based on the spread). Repetitions set the number of trades in which the trade will be divided, for example if you use 1% risk and set Repetitions with 2, the Controladora will open 2 trades with a size in lots that match the 1% given to the actual stop loss you set. Risk Reward sets the risk reward profile that will position the Take Profit indicative line (no order will be attached). For example, if you set 1.0 the line will be drawn at the level where the price needs to be set in order to equal the profit with the risk. All stop loss will be instructed beyond the line with a protective distance equal to the actual spread. Esta herramienta es muy peligrosa. Abre operaciones en bucle hasta el límite de la cuenta. Primero parecía un problema de mis gráficos Renko (offline chart), pero ahora me ha vuelto a pasar un un gráfico simple de M5. No la voy a utilizar más porque no me da confianza. Por suerte, las pruebas eran en demo. Excelente herramienta que ayuda enormemente al trader a manejar todas sus operaciones. Enhorabuena. Echo en falta que los iconos del plug-in "AllHere" fueran más grandes. Sería posible agrandarlos Sergio? Excelente herramienta que te ayuda a gestionar tu cuenta y a mejorar tus resultados. Facilita mucho el trading, tanto a los que empiezan como a los que llevan mucho tiempo. Muy completo. Buen producto, cumple todo lo ofrecido, además de los plugins. Tiene muy buen soporte directo y amable con el autor. Además actualizaciones permanentes con mejoras adicionales. Algo importante: como es un expert adviser es obligatorio que la pc esté prendida con el MT4 corriendo mientras dure la operacion. Si cierra el MT4 o la pc las configuraciones de la controladora se pierden. Great tool for trading! Very happy with the product. I recommend it! 5 stars! Improve the way the sequential risk/reward distance for Above and Below lines is calculated. Now, the Above1 and Below1 lines will keep the original level settled by the Above Distance or Below Distance parameters. From this version now you can only fix the time frame that Control-adora uses to decide if close or open a trade, only to the actual in the chart. Meaning that if you are (for example) in a 1H chart and want to fix the time frame to a 15M: first you need to change the chart's timeframe to 15M, then you add the FT label without change it's text value, and then you can change to any timeframe that you want. If you want to fix other time frame different than the actual, you must set "Force fix other timeframe" to true (not recommended) in order to do so. When this setting value is true, a warning will appear explaining you that we have observed that in slow responsive systems (like some time happens with VPS) fix a time frame different form the actual can produce undesired close of trades. Added function to add a sequential extra distance for lines Above or Below. Added security instruction to re-calculate and try again the closing process when broker returns an error. Added Over ruling choice for asymmetric positioning of lines above and below depending up on the trade if is buy or sell, so you can set like 5 pips of risk and 10 pips for reward, If those parameters are greater than 0 will over rule the distance for Above and Below lines. Added pips measurement feature for lines Above and Below, each line is compared with the respective order when you touch it. The info appears in the comments. Minor bug corrected that only interfered with testing sells using in the Strategy Tester. Correct minor bug related with the Fix Time Frame, now automatically unselects its label after 3 ticks. Added choice (at the bottom of properties) to avoid alerts of price too close to "stoploss" indication. Added choice (at the bottom of properties) to use plain calculations for placement of Stop Loss and "takeprofit" visual reference. Added new function to fix the (On Close Only parameter activated) OCO1 executions on a single timeframe. To fix the OCO1 to a single timeframe, just add Label object (the button with the small T) with FT as its name (fix timeframe) and delete everything contained in the text field (second object's field in its properties). Once the Label is placed with the proper name, Controladora will place it with yellow letters at the right of the Controladora's buttons showing the number of minutes related to the fixed timeframe. This will make that the orders could be closed only when the candle's close has activated the Above or Below lines or the Arrow for program entries in the specific timeframe that you fixed. Improved the way Controladora executes BUY and SELL orders by creating an internal pending list. This list will remain active while the price stays in a predefined range. The range appears in the Expert's properties and its default value is 5 pips. 2) Now you can change the default lot size or risk % on the chart. If you want to use lots just write the number, if you want to use risk % add a percentage symbol at the end (like 3 for lots or 3% for risk). 3) Now you can change the default stop loss distance on the chart. Besides minor issue had been corrected, to place at the top of the chart Control-adora's buttons when the chart originally shows OHLC and then this info is removed, now Control-adora adjust as well the position of it's buttons. Update for 670 build (required if you have this build). Adds a security start-down-count to allow the terminal stabilize it's functions before running the Control-adora. Includes a parameter to vary the start count, you can increase the count or reduce it, depending of your processor velocity. Legal notice added to About tab. Adds filters to avoid trade when platform is disconnected or trade is not allowed in the terminal or the symbol. - Improves the way to send orders to avoid some brokers do not open multiple repetitions if instructed. - Improves the way buttons display if OHLC info is not on the chart. - Improves the way to close all trades to do it in just one tick cycle. When you "hold" an object, the indicator can't delete it, so this can make the Control-adora keep sending instructions to the broker and therefore could cause multiple executions because the same Arrow. We worked around this issue in this upgrade by waiting to the user to release the object before react to an Arrow's conditions. Fixed a bug that resulted in the fact that opening of some orders failed with some brokers, if in 'Control adora' parameter Lots was greater than 0 and Repetitions parameter greater than 1. Lot calculation method has changed. Now the total lot is divided by the number of trades. Eg: if you place 2 repetitions and 1 lot, Control adora will open 2 trades of 0.5 lots each one, to work the same way as with Risk%. New "IntelliOCO" function: Now if parameter "Use always OCO 0 for Take Profit"=true, and if "StopCloseOnly"=1, activators Above1 and Below1 will work as with "StopCloseOnly"=0 (or work at contact) only for the case where this exits represent a take profit. The rest of the activators will remain as "StopCloseOnly" instructs. Added new function to manage several pending orders. If you want to use more than one bs or ss, etc, just place on chart other levels to send orders with adding a sequenced number after the name of the order, eg: bs, bs1, bs2, bs3... In this example once the "bs" is activated, "bs1" will become "bs" and "bs2" will be "bs1" and so forth. The same happens with the stoploss levels: if you have stoploss and stoploss1 or more, when Control adora opens the next trade, it will delete stoploss and stoploss1 will take its place and as well, stoploss2 will be stoploss1, etc. 1) You can write exactly the time (HH:MM), when the alarm will be activated that will send an alert message and close all orders under Control adora control. 2) As well you can set the timer by writing in the text of the label named "timer" the + (plus) symbol and the time that you want to wait to close all orders, for example if a fundamental will come in 45 minutes: you write in the text field of the label named timer "+0:45", the Control adora will set the timer to act in 45 minutes after you place the label. When Control adora recognizes your timer label, it will place it just after the last button of the Control adora. New function to avoid Comments when the buttons are collapsed (if selected from the options). By setting this choice the comments will no be affected by the Control adora unless you have the buttons expanded, but all of control adora functions will remain working as always.